The US Surgeon General between 2000-2006 says he was muzzled or censored when it came to health issues and policies -- that if they didn't fit the Bush administration's political appointees' ideological, theological or political agenda, they would often be ignored, marginalized or simply buried. 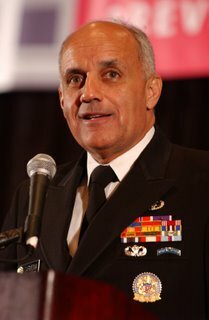 See Christopher Lee's Washington Post story about Richard Carmona's congressional testimony here. The extraordinary interference, censorship and misinterpretation of bona fide science, truthful information, the economy and anything that empowers the average citizen because of the Bush adminstration's political, theological and ideological interference, malfeasance and censorship is not only shocking but historical in its nefarious influence. I think it's safe to say we can expect the typical Democratic party response, "Wow. That's bad."